4.5 How Green is the Sharing Economy? 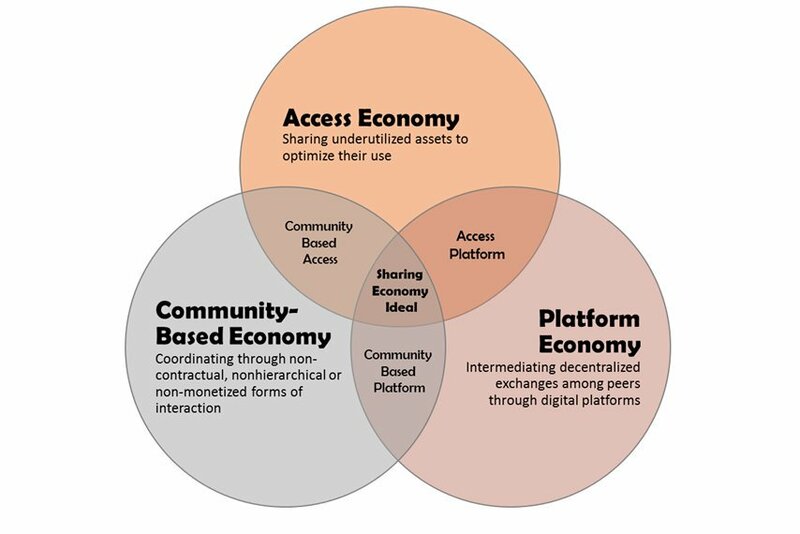 Particular definitions connect the sharing economy to open content, while other equate it with Collaborative Consumption or the Solidarity Economy. None of these involve monetary exchange. We do not use the term “sharing” to refer to an interaction like this: “I’ll give you some food if you pay me.” We call that buying. We don’t use it in this situation either: “I’ll let you temporarily use my toy if you pay me.” We call that renting. And in the third example, while the farmers may have come together initially to purchase a common resource, they don’t pay for subsequent access to it. "What brings people into the sharing economy? And what keeps them sharing? For many of us in the sharing community, we want to know what the gateway is for people to begin to start adopting sharing practices. What draws people to use a P2P car sharing service or Airbnb? The panelists agreed that the functionality of sharing - being able to get your needs met in an efficient way - is what initially draws lots of people, but that community, the ability to meet and interact with others in a positive way, is what keeps them sharing. Casey said that many of his users start using CouchSurfing just as a convenient service, but end up truly believing that sharing is a movement, and are eager to become part of the larger community. How important is building trust? Trust and security are big issues within sharing communities. Initially, in order for someone to share, there’s an inherent small level of trust that a user must have to try out a service, and that initial trust can be aided by how well a service can build trust, connection, and safety into it's platform. One form the need to create trust has taken is the creation of reputation systems - but there is a lot of debate about how to regulate these systems and whether they can actually inhibit the natural building of trust and community. For example, sites like eBay had a tough time regulating retaliatory negative feedback from users (e.g. - if you write me a negative review, then I’m going to write you a negative one). So, they along with many other sites have ended up “filtering” negative feedback. However, hiding negative feedback also inhibits a feeling of trust. So, how can people who manage online communities allow people to be honest about their experiences while at the same time promoting a positive, self-policing, community? And how do you protect people who are not actually at fault but get bad reviews? Some possible solutions that were suggested were encouraging people to resolve their issues with their fellow users first, or to report negative feedback directly to the service so that an independent party can regulate reputations. Another conversation that’s beginning to happen is the idea of creating a sort of reputation system that spans across platforms. Is it fair to assume that someone who is a good Airbnb user would also probably be a good car sharer? Could it be possible to aggregate someone’s reputations on different platforms into one reputation score? How can we insure that online sharing communities are fair and democratic? As was mentioned last night, communities are nothing new - and there’s just as much of a history of bad, dysfunctional communities as there is good ones. There is always the potential for problems to abound in communities. They can become homogeneous, exclusive, or begin to police themselves based on the majority’s norms. How do we make sure that sharing communities both online and off stay open, fair, and democratic? Reputation systems in the current economy, namely, credit scoring agencies, tends to skew in the favor of people with higher incomes with more affluent backgrounds and create a stratified system of haves and have nots. If someone were to get a bad reputation in the sharing economy, would they have the opportunity to get to repair it? How? And who would be the authority that decides who is a fit user and who isn’t? While the answer is unclear, I think it was agreed that it’s important to not recreate the same inequalities that exist in the current economy in this new Sharing economy, and that a commitment to transparency and democracy are important to the future of sharing communities. If sharing platforms are helping to lower the barrier to connection for people, what does that mean for our society? From a conversation between Casey Fenton from CouchSurfing, Shelby Clark from RelayRides, Elizabeth Mueller from Airbnb, and Paolo Parigi and Bogdan State who are studying trust at Stanford University. Event: Collaborative Chats at Hub SoMa. Series’ first topic - Building Community in the Sharing Economy. "Present-day commercialized sharing falls mainly into two categories: mediated micro-entrepreneurship and serialized rental. 1) Mediated Micro-Entrepreneurship entails the brokerage of individual assets and/or labor and irregular work opportunities for which the match-making platform receives a commission. Applied within the field of urban mobility, this is the strategy operationalized by Uber, which relies on iterant drivers to provide on-demand taxi services using their own cars. 2) Serialized Rental, by way of contrast, is common to anyone who has picked up a car at the airport from Hertz or one of its competitors, but the business model has more recently been adapted for intra-urban travel and spur-of-the-moment city trips by ZipCar (a subsidiary of the Avis Budget Group), Car2Go (a subsidiary of Daimler AG), and a host of other companies. "Neal Gorenflo of Shareable expressed a useful distinction between sharing that is transactional and sharing that is transformational. "Sharing economy activities fall into four broad categories: recirculation of goods, increased utilization of durable assets, exchange of services, and sharing of productive assets. The origins of the first date to 1995 with the founding of eBay and Craigslist, two marketplaces for recirculation of goods that are now firmly part of the mainstream consumer experience. These sites were propelled by nearly two decades of heavy acquisition of cheap imports that led to a proliferation of unwanted items. In addition, sophisticated software reduced the traditionally high transaction costs of secondary markets, and at eBay, reputational information on sellers was crowdsourced from buyers, thereby reducing the risks of transacting with strangers. By 2010, many similar sites had launched, including ThredUp and Threadflip for apparel, free exchange sites like Freecycle and Yerdle, and barter sites such as Swapstyle.com. Online exchange now includes “thick,” or dense, markets in apparel, books, and toys, as well as thinner markets for sporting equipment, furniture, and home goods. The second type of platform facilitates using durable goods and other assets more intensively. In wealthy nations, households purchase products or hold property that is not used to capacity (e.g., spare rooms and lawn mowers). Here, the innovator was Zipcar, a company that placed vehicles in convenient urban locations and offered hourly rentals. After the 2009 recession, renting assets became more economically attractive, and similar initiatives proliferated. In transportation, these include car rental sites (Relay Rides), ride sharing (Zimride), ride services (Uber, UberX, Lyft), and bicycle sharing (Boston’s Hubway or Chicago’s Divvy Bikes). In the lodging sector, the innovator was Couchsurfing, which began pairing travelers with people who offered rooms or couches without payment back in 1999. Couchsurfing led to Airbnb, which has reported more than 10 million stays. The third practice is service exchange. Its origins lie in time banking, which, in the United States, began in the 1980s to provide opportunities for the unemployed. Time banks are community-based, non-profit multilateral barter sites in which services are traded on the basis of time spent, according to the principle that every member’s time is valued equally. In contrast to other platforms, time banks have not grown rapidly, in part because of the demanding nature of maintaining an equal trading ratio.6 There are also a number of monetized service exchanges, such as Task Rabbit and Zaarly, which pair users who need tasks done with people who do them, although these have encountered difficulties expanding as well. "While all sharing economy platforms effectively create “markets in sharing” by facilitating exchanges, the imperative for a platform to generate a profit influences how sharing takes place and how much revenue devolves to management and owners. For-profit platforms push for revenue and asset maximization. The most successful platforms—Airbnb and Uber, valued at $10 and $18 billion respectively— have strong backing from venture capitalists and are highly integrated into existing economic interests.8 The introduction of venture capitalists into the space has changed the dynamics of these initiatives, particularly by promoting more rapid expansion. While some of the platforms present a gentle face to the world, they can also be ruthless. Uber, which is backed by Google and Goldman Sachs, has been engaging in anti-competitive behavior, such as recruiting its competitors’ drivers. While its representatives articulate a neoliberal rhetoric about the virtue of “free markets,” the company is apparently hedging its bets on what “free” markets will deliver for it by hiring Obama campaign manager David Plouffe to bring some old-fashioned political capital to its defense. By contrast, many of the initiatives in the sharing space, such as tool libraries, seed banks, time banks, and food swaps, are non-profits. They do not seek growth or revenue maximization, but instead aim to serve needs, usually at a community scale. While the for-profit vs. non-profit divide is the most important one, the divide between P2P (peer-to-peer) and B2P (business-to-peer) platforms is also significant. "Motives for participating in the new sharing economy differ, which is not surprising given the diversity of platforms and activities. Some participants are drawn by the trendiness or novelty of the platforms. It is, however, important to recognize that the novelty about which many participants (and platforms) talk can be an expression of classism and racism. Sharing is not just a relic of pre-modern societies; such practices remain more common in working-class, poor, and minority communities. The discourse of novelty employs a false universalism that can be alienating to people who have maintained non-digital sharing practices in their daily lives. Beyond novelty and the pull of new technologies, participants tend to be motivated by economic, environmental, and social factors.10 Sharing economy sites are generally lower in cost than market alternatives. Particularly with P2P sites, value can be redistributed across the supply chain to producers and consumers and away from “middlemen,” in part because producers’ costs are lower. An Airbnb host, for example, can deliver a room more cheaply than a hotel. The platforms’ fees are also lower than what established businesses extract in profits. (Airbnb’s maximum fee is 15%.) Service and labor exchange platforms, whether they are time banks or for-profit platforms like Task Rabbit, extract far less value than traditional agencies that arrange child care, concierge services, or home health care aides. The platforms also allow people to earn money in ways that had not previously been safely or easily available. Many sites advertise themselves as green and present sharing as a way to reduce carbon footprints. It is a truism among “sharers” that sharing is less resource intensive than the dominant ways of accessing goods and services (e.g., hotels, taxis, shopping malls) because of the assumed reduction in demand for new goods or facilities. The actual environmental impacts of the sites are far more complicated, however, as will be discussed in the following section. The desire to increase social connections is also a common motivation. Many sites advertise this feature of their activities, and participants often articulate a desire to meet new people or get to know their neighbors. While heartwarming anecdotes about making new friends are plentiful, many platforms fail to deliver durable social ties. For instance, a recent study of carsharing found that the two parties to the transaction often never met on account of remote access technology. While many provide services through these platforms as a way to supplement their income from other traditional jobs, as these types of jobs become scarcer, an increasing number of people rely on their participation in sharing platforms as their main or sole source of income. In the U.S. we see the unemployment rate falling not only because of more jobs being available, but also due to an increasing number of people opting out of the traditional jobs market and becoming independent contractors in the gig economy. In an interesting article in the Washington Post, Catherine Rampell places the sharing economy within the larger history of how, over the last 40 years, corporations have shifted risk on to their workers. “The risks involve everything from income instability (the worker, rather than the firm, has to absorb the brunt of demand shocks or price cuts); to irreversible capital investments (Über and Lyft have infamously pushed drivers to buy new cars by promising big returns that never materialized); to unforeseen criminal liabilities (what happens if an Airbnb guest turns your home into a brothel? ); to fewer protections in the event of catastrophe (no access to programs such as workers’ comp).” This process is further detailed in Jacob Hacker’s classic book, The Great Risk Shift: The new economic insecurity and the decline of the American dream. As labor researcher and attorney Veena Dubal explained at a recent conference on the sharing economy, “Since the 1970s, forces have aligned to create work that is more precarious. ‘Rideshare’ companies contribute to that culture of precarious work, putting workers back in early 20th century conditions. They’ve made it really easy to get a ride – at the cost of workers’ lives… It’s the great risk shift.” This is because the service providers in these sharing economy exchanges are not considered to be employees and receive none of the perks associated with employment like paid sick days, health care and Social Security. Natasha Singer in the New York Times has an interesting exposé about the precariousness of being a service provider for a variety of sharing platforms. "The debut of the sharing economy was marked by plenty of language about doing good, building social connections, saving the environment, and providing economic benefits to ordinary people. It was a feel-good story in which technological and economic innovation ushered in a better economic model. Especially in the aftermath of the financial crash, this positive narrative was hard to resist. Social activists flocked to these initiatives, hoping to piggyback on their popularity. Maybe, they thought, digital P2P platforms could be a pathway to a true grassroots, inclusive, fair, and lowimpact economy. Dean Baker, a progressive economist, claims the new sharing is “largely based on evading regulations and breaking the law” and subjects consumers to a substandard, possibly unsafe product.19 Anthony Kalamar has called out “sharewashing,” in which platforms shift risk onto employees under the guise of “sharing.” Tom Slee, writing in Jacobin, has challenged Airbnb’s claim that its users are single individuals earning small amounts of extra money, finding that half the revenue generated in New York City accrues to hosts with multiple listings. We also need to consider the diversity of industries in which sharing platforms are operating. Some sectors are characterized by high rents that are easy to capture with disruptive technologies. Consider taxis. The biggest impact is likely the erosion in the value of medallions, the licenses they must possess to operate, because these medallions yield pure rents. While drivers in conventional operations may be capturing some of this excess profit, they are already facing adverse market conditions and, in many places, earning low hourly wages, as they are forced to pay high leasing and other fees to the owners of the medallions and vehicles. Union members fare better, but could they do better with Uber? Many have switched in hopes that they can. So far, though, the results are mixed, in part because they face increasing competition from platforms like UberX and Lyft, on which drivers use their own cars. And early high returns have been reduced by Uber’s fare cuts, which have led to driver protests and organizing efforts. An online platform with a good rating system should improve labor conditions. Consider the market for home health aides, where agencies currently take an enormous fraction of hourly fees, sometimes more than half. A P2P matching platform would take a lower fraction, enabling low-paid workers to earn considerably more and have more autonomy over which jobs they accept. Where owners, agencies, or other actors are extracting rents, P2P platforms should do what they claim—distribute value to consumers and producers and away from gatekeepers and rent extractors. "Most sharing economy websites advertise their green credentials, and many users care about their ecological impact. The ecological benefits of sharing are often seen as obvious: secondary markets reduce demand for new goods, so footprints go down. Staying in existing homes reduces the demand for new hotels just as toolsharing reduces new tool purchases. However, despite the widespread belief that the sector helps to reduce carbon emissions, there are almost no comprehensive studies of its impact. At this point, they are long overdue. An exception is a recent study of carsharing. It found a measurable reduction in greenhouse gas emissions, but only because of substantial reductions from a small fraction of households. For the majority, carsharing, by expanding access to cars, increased emissions. "This is a dumb term and it deserves to die. It started, as best I can tell, with Zipcar which predates most of these companies and from the get-go described its product as "car sharing." The main problem with that description is that it wasn't car sharing. Zipcar was not and is not a service that facilitates the formation of automobile co-ops in which multiple households combine to collectively own and share a fleet of vehicles. That would be an interesting idea for a business, but it's not Zipcar's business. The way Zipcar's business works is that a firm owns a fleet of vehicles and then offers them as short-term rentals to its customers. They made up the word "car sharing" because the rental car business was well-established already and Zipcar wanted to rent cars in a different kind of way, so they needed a way to signal to people that it wasn't a head-to-head competitor with Hertz. But of course things metastasized. So when cities started creating municipally chartered short-term bicycle rental entities, those were known as "bike sharing." Things really got nasty when AirBNB launched a short-term rental platform for residential housing, because both the housing and hotel sectors are heavily regulated and taxed in different kinds of ways. Wouldn't it be better to just say we're sharing rather than running a hotel? Tom Friedman's latest sharing economy column is about a website that seems to be a platform for selling used clothing. "Here are eight prime reasons why the sharing economy is just a cover for Silicon Valley greed. Uber made plenty of headlines during a huge winter storm in New York in December, when riders found themselves paying three times the normal price to hail a car in the middle of the snow and frozen rain. Uber founder Travis Kalanick defended the “surge pricing” as a way to provide an incentive to drivers to stay out on the streets; but to many riders, the experience didn’t feel a whole lot like sharing. And as I learned all too well when I tried to use AirBnB to find a room in Austin, Texas, during the SXSW festival last year, Austin’s AirBnB hosts weren’t a bunch of Good Samaritans looking to lend out their couches — they were cold hard capitalists dedicated to charge as much as the market could possibly bear. Go over to the website for Peers.org, an advocacy group that describes itself as “a member-driven organization that supports the sharing economy movement.” First, scroll down to the bottom of the page and review the list of Peers’ “partners”: It’s a who’s who of “sharing economy all-stars.” Now go one step further, and look at where these companies are raising their money from: It’s a who’s who of Silicon Valley venture capital firms. AirBnB has raised money from Benchmark Capital, Greylock, Sequoia Capital and Founders Fund (featuring Peter Thiel and Sean Parker). Lyft is backed by Andreesen-Horowitz, Mayfield Fund and Founders Fund. Homejoy (a cleaning service coordination app) has raised cash from Google Ventures, Redpoint Ventures and First Round Capital. Sidecar is backed by Lightspeed Venture Partners and Google Ventures. Yerdle — which purports to help you clear out your closet — is a Kleiner-Perkins play. What other “movements” do you know that are massively funded by venture capitalists? Peers.org originally described itself as a “grassroots” organization. Now it’s “member-driven.” Peers director Natalie Foster also made a bid deal, in the past, of stressing how Peers is not technically a “lobbying” organization. And yet, ever since its founding, Peers has been vigorously organizing citizen support for sharing-economy companies who’ve been fighting regulatory battles against local governments. Peers has been particularly active in support of AirBnB’s struggles against municipal laws restricting short-term rentals. One of Peers’ cofounders is Douglas Atkin, an AirBnB executive. One reason that Silicon Valley sees profit potential from the sharing economy is that sharing-economy startups are often able to avoid crucial costs that burden their competitors. Like, for example, taxes. In San Francisco, the city raised $191 million in 2013 from a “transient occupancy tax.” Technically, AirBnB hosts are required to pay that tax, but most just skip it. As a result, not only is the city’s tax base undermined, but AirBnB ends up with a distinct competitive advantage against the established hotel industry. 5. The sharing economy equals low wages! What do TaskRabbit, Fancy Hands and Amazon’s Mechanical Turk have in common? They provide ways for people to get paid as little as possible for temp labor broken down into the smallest possible jobs (getting your cable service cancelled, making a dentist appointment, cleaning out the junk in your basement. Hooray for Silicon Valley: These startups have managed to create a truly efficient labor market. Workers get no benefits and aren’t covered by minimum-wage laws. The sharing economy: Where everyone is an independent contractor competing against everyone else for crumbs. Who is responsible when something goes wrong? This is a huge issue for ride-sharing services. On New Year’s Eve, an Uber driver who was in between fares hit and killed a 6-year-old child. As Marcus Wohlsen explained in Wired, Uber is trying to make the case that since it was not “’providing services on the Uber system’ at the time of the accident,” and, as such, the company is not liable for the accident. Again, avoiding having to carry the cost of insurance for its drivers gives Uber and other car-sharing services an obvious competitive advantage against established taxi companies. Many municipalities have laws on the books forbidding homeowners from renting out their rooms for less than 30 or 60 days. The reason? To prevent landlords from operating unregulated hotels. Real hotels are required to adhere to a raft of safety regulations designed to protect the public welfare. Apartments rented out through AirBnB avoid those regulations, even if they are, for all intents and purposes, used for the same purposes. In New York, for example, some apartment landlords have employed AirBnB as a booking operation for short-term hotel rentals. New numbers released this week revealed that most of the rooms rented on AirBnB in New York were in homes or apartments that were never occupied by their owner. Not a whole lot of “sharing” going on here — just a bunch of subletting. "Sascha Lobo, a German technology blogger for Der Spiegel, has recently suggested to drop the obscure notion of “sharing” altogether. “What is called sharing economy,” he argues, “is merely one aspect of a more general development, i.e., a new quality of the the digital economy: platform capitalism.” As Lobo emphasizes, platforms like Uber and AirBnB are more than just internet marketplaces. While marketplaces connect supply and demand between customers and companies, digital platforms connect customers to whatever. The platform is a generic ‘ecosystem’ able to link potential customers to anything and anyone, from private individuals to multinational corporations. Everyone can become a supplier for all sorts of products and services at the click of a button. This is the real innovation that companies of the platform capitalism variety have introduced. Again, this is miles away from sharing but instead represents an interesting mutation of the economic system due to the application of digital technology. In fact, the argument is quite an obscene one, particularly if it is made by the stakeholders of platform capitalism themselves. As globally operating digital platforms, these companies have the unique ability to cut across many regional markets and reconfigure traditionally specific markets for goods and services as generic customer-to-whatever ‘ecosystems’. It seems fairly obvious that the entire purpose of the platform business model is to reach a monopoly position, as this enables the respective platform to set and control the (considerably lower) standards upon which someone (preferably anyone) could become a supplier in the respective market. Instead of cutting out the middleman, digital platforms have the inherent tendency to become veritable Über-middlemen, i.e., monopolies with an unprecedented control over the markets they themselves create. In fact, calling these customer-to-whatever ecosystems “markets” often turns out to be a bit of a joke. For the clients of Uber & Co., price is not the result of the free play of supply and demand but of specific algorithms supposedly simulating the market mechanism. The effect of such algorithmic tampering with the market is demonstrated for instance by Uber’s surge pricing during periods of peak demand. It is not very difficult to see where this might be leading. Taking a cab to the hospital in, say, New York City during a snow storm might become unaffordable for some under conditions of mature platform capitalism. For those who believe this to be overly pessimistic and a bit of an exaggeration, just ask your local taxi driver what percentage of her work is already coming from one of the digital platforms. “By controlling their ecosystems, platforms create a stage on which every economic transaction can be turned into an auction. Nothing minimizes cost better than an auction – including the cost of labour. That’s why labour is the crucial societal aspect of platform capitalism. It is exactly here that we will have to decide whether to harness the enormous advantages of platform capitalism and the sharing economy or to create a ‘dumping market’ where the exploited amateurs only have the function to push professional prices down." I agree. The basis for such a decision needs to be a proper understanding of the reality of platform capitalism. The anger we have seen over the last few months directed against the “sharing economy” has a lot to do with the utterly unsubstantial claims and stories that are constantly churned out by the marketing machine of platform capitalism. Take John Zimmer, co-founder of Lyft, who told Wired earlier this year that the sharing economy bestows on us the gift of a revived community spirit. Referring to his visit to the Oglala Sioux reservation, he writes: “Their sense of community, of connection to each other and to their land, made me feel more happy and alive than I’ve ever felt. We now have the opportunity to use technology to help us get there.” No question, the pompous impertinence of this comparison is truly breathtaking. And yet, neither is this kind of rhetorical gymnastics the exception in the sharing-scene nor does it come unmotivated. "I am all there with Arun Sundararajan, professor at Stern School of Business at NYU, who describes walking down the street in New York City, musing on all the parked cars that remain unused ninety-two percent of the time. He gets it right; it seems awfully inefficient, even wasteful. Why couldn’t he just pick up one of those vehicles, run an errand, return the car to that same spot thirty minutes later, clip a twenty dollar bill under the sunshade, and be done? But then he claims that such emerging marketplaces can perfectly self-regulate and should be left to their own devices. Sharon Ciarella, Vice President of Amazon Mechanical Turk, made a similar argument: Mechanical Turk workers would just vote with their feet — they could not be tricked into performing exploitative work. All good here; no intervention needed. Not so fast. It is surprising that crowdmilking practices on Amazon’s Mechanical Turk still have not raised red flags in the offices of regulators. Based on these examples, it should be clear how sorely regulation is needed. I agree with Evgeny Morozov who pointed out that the so-called “sharing economy” is nothing but the logical continuation of crowdsourcing. A company like Uber is not free from those dynamics. There is a reason that taxi fares are regulated; it prevents abuse. I rode in a town car recently and was quoted $16 for my trip. Through Uber, the same trip would have cost between $21 and $27. But it is also all so electrifying. Uber is valued at 10 billion dollars and Airbnb, a company founded in 2008, is valued higher than the Hyatt hotel chain. Airbnb offers as many rooms as Intercontinental, which has 4600 hotels with 120,000 employees in over 100 countries. It took Intercontinental sixty years to build this business empire. Hyatt and Intercontinental had to hire architects and build up an enormous infrastructure. And then here comes Airbnb, which offers an impressive 500,000 listings in 33,000 cities in more than 192 countries. So far, Airbnb has hosted 8.5 million guests without ever turning a brick. All they got is an app; it’s a logistics company. Are we looking at a secret plot, a covert p2p takeover? Companies in the “sharing economy” can only function because they are using your “assets,” your resources: your car (Bla Bla Car, Getaround), your apartment (Airbnb), and your computing power (Skype). "AirBnb, and other sites such as Uber , where drivers car-share with passengers for short routes in town or, Greek-origin Cookisto , where amateur cooks deliver home-cooked meals, are part of a phenomenon that has been dubbed “the sharing economy”. As the title of Rachel Botsman´s book tellingly puts it, in this new economy “what´s mine is yours ”. I offer my house, and you offer yours. You cook for me, or I can cook for someone else. Use takes the place of ownership. Instead of buying new consumer goods, in this “sharing economy” we collaborate to share goods that we already have, when we do not need them: from rooms, houses, cars and bikes, to appliances, drills, or even dogs (in BorrowMyDoggy ). Of course, borrowing, lending and doing small favours are not new phenomena. What is new is the scale in which these can now take place. The new online social networking platforms allow exchanges not only between friends and neighbours, but between complete strangers, from different parts of the world. As with everything new under capitalism, creation brings destruction. The new economy is disrupting existing industries. Last June, London grinded to a halt by a strike held by 10 thousand taxi drivers who demonstrated with their vehicles on the city centre against Uber, whose low prices are threatening to put them out of business. In theory, Uber drivers were supposed to be everyday people who decide to make an extra buck by taking a passenger with them in their rides. In reality, most drivers are former taxi drivers who are exploiting the legal gap and drive without having to pay for insurance or for a license. For similar reasons, in New York or San Francisco, hoteliers accuse AirBnb of unfair competition. Its hosts do not pay municipal taxes, do not have to meet expensive safety regulations, and can operate wherever they want, and outside the zones set out by planning authorities for tourism activities. It is hard to sympathize with taxi drivers or hoteliers, or lament that the prices of these, often overpriced, services are going down as a result of the “sharing economy”. However, there is a deeper issue at stake here. Laws and regulations exist for a reason. Municipal taxes finance the public infrastructure that is then used by tourists. Planning authorities limit the number of “room to let” or the taxis in a city, because otherwise life can become unbearable for the inhabitants of the city. I have many friends in Barcelona who have experienced a total transformation of their apartment blocks, suddenly finding themselves alone within AirBnb rentals, unable to sleep from the parties of weekend travelers. Rental prices in the centre of Barcelona are sky-rocketing, as owners find it more profitable to rent on AirBnb than hold long-term leases. New “entrepreneurs” bid prices up, renting apartments that they then sublet at AirBnb. Zoning restrictions for new hotels was a key site of struggle for Barcelona´s neighbourhoods’ movements. But all this has become now irrelevant by the unregulated avalanche of AirBnb houses popping up literally everywhere and changing the form and composition of the city. Regulatory authorities are slowly catching up. In Barcelona, municipal authorities fined AirBnb with the symbolic sum of €30 thousand for advertising apartments that did not have rental permits. After a public backlash against unregulated rentals in the neighbourhood of Barceloneta this August, with spontaneous citizens´ protests, the municipality has started a door-to-door check, closing down rented apartments that lack a permit. In New York, authorities have begun evicting people who sublet apartments that do not belong to them, whereas in San Francisco authorities file lawsuits against short-term rentals that violate the law. AirBnb, and other companies such as Uber, which have come under the attention of regulators respond that over-legislation is threatening to kill innovation at its birth. If, in order to rent out a room or give a ride, one has to get a license like a hotel or a taxi, then this becomes an economically impossible proposition. AirBnb is running a huge advertising campaign in New York , reminding New Yorkers the benefits it offers to them, not least income. Mobilizing their so-called “communities”, companies like AirBnb or Uber are organizing counter-protests, involving their users. This discourse of “community” and “sharing” is instrumental not only for mobilizing people in regulatory battles, under the guise of a romantic battle for a different economy, but is also essential in building up a case, that these ventures are not like any other capitalist venture, and therefore merit a different treatment from the regulators. the case for a special treatment by regulators seems weak, if one considers other factors. First, AirBnb itself is a capitalistic corporation like any other, valued at $10 billion. Its profits - dozens of millions today- are forecast to reach an estimated $1 billion per year in the coming years. AirBnb is a company with only 600 employees, with relatively low costs (related to software development and operation), but with a potentially huge market under its reach. This is a company that can potentially control the global market for short-term rentals, charging a 10-15% commission in each and every exchange. Online social networks are not only bringing people from faraway together, but also are creating global markets, where only local segmented markets existed before. The profits from these markets are astronomical unlike anything a real estate agent would ever dream of and concentrate in the pockets of a few entrepreneurs and venture capitalists, a concentration with probably precedent in history. Tellingly, but somewhat exaggeratingly, this has led some to call companies like AirBnb, a “mafia of intermediaries”. Second, most of the transactions taking place under AirBnb are pure rentals, involving money. It is a euphemism to call them “sharing” and hence argue that they should not be regulated or taxed. They are normal economic transactions. Where is the sharing in renting at AirBnb, and why is it “peer-to-peer” when you rent at AirBnb but not when you rent in the rental market? In the rental economy of AirBnb a whole suit of small scale intermediaries are popping up, from those who rent houses and then sublet them through AirBnb, to companies who take care of everything that needs to be done for renting your house at AirBnb (from furnishing it, to managing the listing), for a cut on the deal. It’s one thing to host someone in your home with the prospect of someday being hosted in theirs too, as is the case with Couchsurfing , or to exchange your home, as in HomeExchange (in both cases without the mediation of money), and another one to rent or pay to rent. Third, and worse of all, under a rhetoric guise of “sharing”, websites like AirBnb or Uber are creating a new informal economy of uninsured workers whose entire life is up for rent, from cars and homes, to their own hands available to perform chores for a fee in sites like “taskrabbit ”. Entire professions - cab drivers, cleaners etc- are passing in this way into a new black economy- unregulated, tax free and uninsured. And instead of (or alongside) the much-touted socialization and community, the result is the commodification of the final shreds of social life that had remained outside the economy. Everything now is available to rent, at the right price; from empty rooms to an unused frying pan. Nothing any more is available for free. Hosting a friend at your house has an “opportunity cost”, eroding the value of hospitality. The rental economy of AirBnb is not the same as the real sharing economy of urban gardens, time banks or couchsurfing, where users truly share their work, their resources and their assets, without the intermediation of money, and crucially without profit. The rental economy is the inevitable, within capitalism, commodified version of the sharing economy. As the crisis opened opportunities for new forms of mutual aid and sharing, enterprises such as AirBnb saw the opportunity to monetise them and profit. As for the environment, I am not sure that leaving nothing idle is good for the environment. The “sharing economy” mobilizes and puts everything into circulation, retaining at all costs an unsustainable consumption model. Not my view of a sustainable future. In conclusion: AirBnb is a rental intermediary. It is a capitalistic enterprise like any other and a very innovative and successful one in that. It should be treated, regulated, zoned and taxed as such. The same applies for those who profit from it. Exemptions could be made for those who do not use it professionally or do not make money from it (this can easily be ascertained by the frequency, duration and value of the services offered as the websites document everything). Renting is not sharing: it should be regulated and taxed." "It appears a new kind of working life is emerging. It is a life in which who you are and what you can do are displayed to the world in the form of a standardized profile: your skills and the tasks you can perform listed in standard tick-box form, perhaps embellished with some self-promotional text. The strangers with the power to hire you can assess the quality of your work through user ratings that may reflect informed judgement but might equally be an indication of poor taste or a rationale for not paying you. You don’t know from one week, day, or even hour to the next when or whether you will have work: so keep the smartphone always at hand, ready to hit “accept” at a moment’s notice. You are, in short, permanently logged on. And since your work is largely carried out online, your every activity is recorded. You are thus continuously generating the data that makes it possible for you to be monitored even more closely, with increasingly precise performance indicators, reducing still further any wiggle room for individual autonomy. You become part of an atomized workforce, in which individuals are increasingly interchangeable. Their labor is logged: logged in the sense of being chopped up into standardized units; logged in the sense of being connected online, and logged in the sense of being recorded for future analysis. You could call it triply logged. This might seem overly dystopian. After all, it can be argued, the kinds of work that are now increasingly managed by online platforms have always been precarious. When was taxi-driving or freelance copy-editing ever secure? By what stretch of the imagination was cleaning or running errands ever regarded as a regular job? Debating the Sharing Economy By Juliet Schor. This page was last modified on 3 April 2018, at 03:05.